marital bless: Happy Costume Day! I couldn't quite bring myself to say Happy Halloween, as it's not a holiday I really celebrate or a phrase I say. I definitely did not go trick or treating growing up, partially because my Mom thought there was a needle in every candle, and partially because it wasn't something my Mom wanted to promote. All of this to say, I could not stop myself from looking at Halloween costumes for Isaac. To top it off, when I showed my Mom the one that I liked the most, she bought it for him. I think this is the first of many instances where my Mom will prove to be much more lax with Isaac than she was with us lol! For the first time Tony and I carved pumpkins together at our friend's house Monday night. It's currently outside getting rained on and I'm not sure if I'll get a better picture, so I thought I'd share my free-hand "Isaac" pumpkin. I cannot wait to see pictures. And that pumpkin is pretty darn good for free stylin! I love reading your blog because you love your family so much! That boy Isaac sure is blessed with a sweet Mama! We didn't do Halloween growing up as kids, either...and it's still not a "holiday" (gag) that I promote. 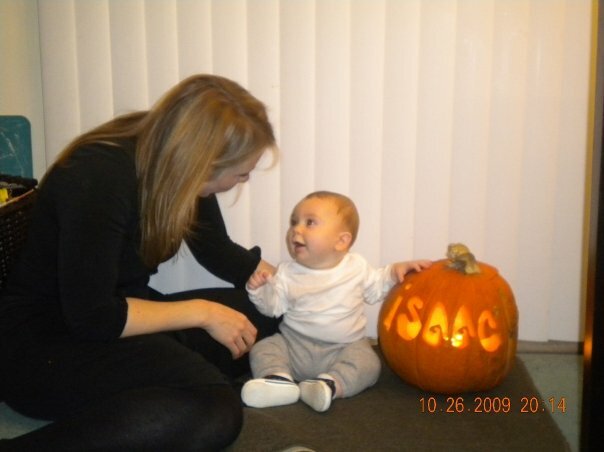 But I can't say I don't blame you for looking at costumes for Isaac...the stuff they have for babies is ADORABLE! PS: Great job on the pumpkin, it looks awesome! I'm not a big Halloween fan either...mostly because I have distinct memories of going Trick-or-Treating as a 3rd and 4th grader and not being given any candy because everyone said I was "too old". I was just tall for my age (I was 5'9" in 4th grade). I HATED Halloween after that. What a cute pumpkin we always just go to our churches fall festival that's our "Halloween". Can't wait to see Isaac's costume. Even though we celebrated Halloween in my family, it definitely isn't one of my favorites. It never has been, hopefully now with a little one I can begin to enjoy it more! I can't wait to see Issac's costume! Gorgeous! Look at him lovin on his mama! Your pumpkin turned out awesome! We didn't celebrate Halloween growing up either but I just had to put my baby in a costume. It was just too hard to resist!